Newspaper Rock: Ty Longshadow = Apache Chief? By John BabosIn this week’s episode five of Young Justice Invasion: Season 2 titled “Beneath”, from Cartoon Network’s DC Nation block of programming, we see the debut of a seemingly younger version of a classic TV iconic cartoon hero. Intrigued? 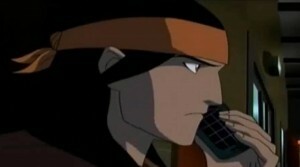 The episode opens with a Native American boy named “Ty” who is reaching out to his friend Jaime Reyes–who happens to be the teen hero Blue Beetle on Young Justice–after a fight with his mom’s boyfriend. Ty is planning to runaway to Houston via bus, but is kidnapped before Jaime can get to the bus station to stop his already thwarted runaway plans. Interestingly the mystery around Ty forms the subplot of this week’s episode. So, big things are likely ahead.Ty looks a lot like a young Apache Chief--down to the stereotypical bandana. But there's more:Throughout this week’s Young Justice episode on Cartoon Network more clues emerge, beyond appearance, that make the case for Ty being (eventually) the Young Justice world’s (Earth 16 in the DC Comics / Entertainment multiverse) Apache Chief or perhaps a character with a less stereotypical nom de guerre. For instance, when Jaime Reyes visits Ty’s mom, we learn that her name is Shelley Longshadow. In addition, Jaime also visits Ty’s maternal grandfather named Holling Longshadow. So, why are these two references significant clues in the Apache Chief puzzle? Well, in the episode “Ultimatum” of the more recent 2000s era Justice League Unlimited animated series, viewers were introduced to a character code-named Long Shadow who was a Native American with stature changing powers similar to the Super Friends’ Apache Chief. This by itself during the JLU may have been dismissed as a Super Friends connection if not for the uncanny similarities between Long Shadow’s Ultimen teammates to other Super Friends: namely Juice being similar to Black Vulcan and Wind Dragon’s similarity to Samurai. 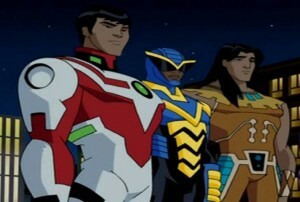 We also learn in the Young Justice Invasion / DC Nation episode that Ty comes from a long line of Apache Chiefs and his grandfather tells Jaime that Ty is likely on a vision quest to seek out his important role in the world.Comment: I imagine DC will introduce Ty Longshadow as...Long Shadow, an update of the stereotypical Apache Chief. Except for Ty's stereotypical appearance, this looks like a good update. Unlike Apache Chief, Ty has a whole history as a real, contemporary person. He's descended from Apache chiefs, which links him to his predecessor. But I trust he's not a (young) chief himself. For more on the subject, see Manitou Raven Was Apache Chief. Ironically, his TV Trope is Canon Immigrant. Go figure. Meh, most people didn't like the minority Super Friends, mostly because 1) they existed nowhere in DC canon, and 2) they were one-note stereotypes. Still more useful than Aquaman, though.